Could Magufuli’s Move To Disconnect Zanzibar From Electricity Grid Widen Cracks Between Zanzibar And Mainland? There are fears that the longstanding disputes between Zanzibar and Mainland Tanzania might escalate following President John Magufuli’s order to disconnect power supply to the Peninsula over a huge electricity debt. Zanzibar, however, blames the Union government for turning a deaf ear to its concerns of economic injustices. They say there is an unfair economic resource sharing arrangement including foreign aid that the Union receives. The House of Zanzibar links the unfairness to the structure of the Tanzanian government. At the centre of the dispute are the electricity charges by the Tanzania’s electricity supply body (Tanesco), which Zanzibar Electricity Corporation (ZECO) says are high. One of the main sources of revenue for the Island is the tourism industry, which highly depends on electricity for its operations. Magufuli’s radical intervention in the old standoff between Tanesco and its customer (Zanzibar), critics say, undermines the latter’s economic interests and the political effect it may have. Magufuli, whose name came to the limelight for his uncompromising approach to corruption and strict leadership, recently ordered Tanesco to disconnect power supply to Zanzibar in disregard of the political effect. Zanzibar says if they are disconnected they will try other alternatives calling the move ridiculous. Ali Mohammed Shein, Zanzibar’s President said that it would be ridiculous for the government to disconnect power supply to Zanzibar over a 20-year old debt. “If they want to disconnect, let them do it, we are not threatened. We will light koroboi (paraffin) lamps,” the Zanzibari leader told local media. Since the disagreements on electricity charges started two decades ago, Tanesco claims that Zanzibar has not been paying for electricity. According to The East African newspaper, Tanesco supplies 60MW to Zanzibar monthly at TSH3.4 billion (US$ 1.7 million). ZECO’s debt has now reached TSH 127 billion (US$57 million) compared with TSH52.53 (US$ 25 million) the Mainland government owes Tanesco. This debt is roughly 7% of Zanzibar’s GDP of $US860 million. Threatening to disconnect Zanzibar has been tried before, in 2014, but it never yielded results. It was against this background that the Parliamentary Public Accounts Committee recently issued a six-month ultimatum to all Tanesco debtors to pay. To Magufuli, the debt issue goes beyond the Zanzibar isle. He says his order is not selective. He gave Tanesco permission to disconnect State House should it be found with electricity debts. It is just a coincidence that Zanzibar happens to be the ‘biggest’ debtor. But, experts in economics have warned of the looming adverse economic effects if Tanesco goes on to execute the presidential directive. They suggest that the disputes between the Isle and Mainland Tanzanian may escalate. 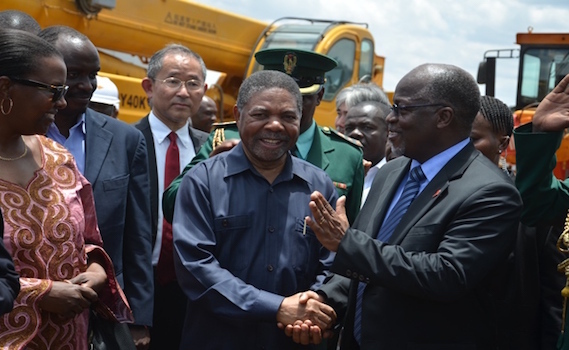 “This is a sensitive issue, politically, and the Mainland government, which is responsible for electricity generation and supply to both sides of the Union should be careful when discussing power disconnections to Zanzibar,” Prof. Haji Semboja told the East African. Suggestions are that, Tanzania (Tanesco) and Zanzibar should settle the issue amicably through agreeing on the modalities of paying the debt as opposed to power supply disconnection to Zanzibar. Meanwhile, talks are already ongoing between officials from both sides whose relations are apparently at a low point. According to the Constitution that came into play in 1964 when Tanganyika and Zanzibar merged, the Tanzanian government has full mandate over the administration and management of the Union matters. Under this political arrangement, only identified with the Peninsula, are handled by the government of Zanzibar. Economic hiccups now affecting the Isles are blamed on what Zanzibar’s representatives call ‘unfair fiscal and monetary’ Union agreements with double taxation of the goods that leave Zanzibar into the Mainland being at the centre of the conflict. The Presidential electricity directive fell against this backdrop of longstanding claims by the government of Zanzibar of economic injustices triggered by unfair fiscal and monetary Union agreements that they say are responsible for the economic ordeal. -Total of 18 isolated mini-grids with total installed capacity of 82 MW. Out of these two mini-grids with installed capacity of 29 MW is running on natural gas while the remaining 15 mini-grids with total installed of capacity of 53 MW are diesel generators. Experts Talk: Can Rwanda Do Away With Cash?